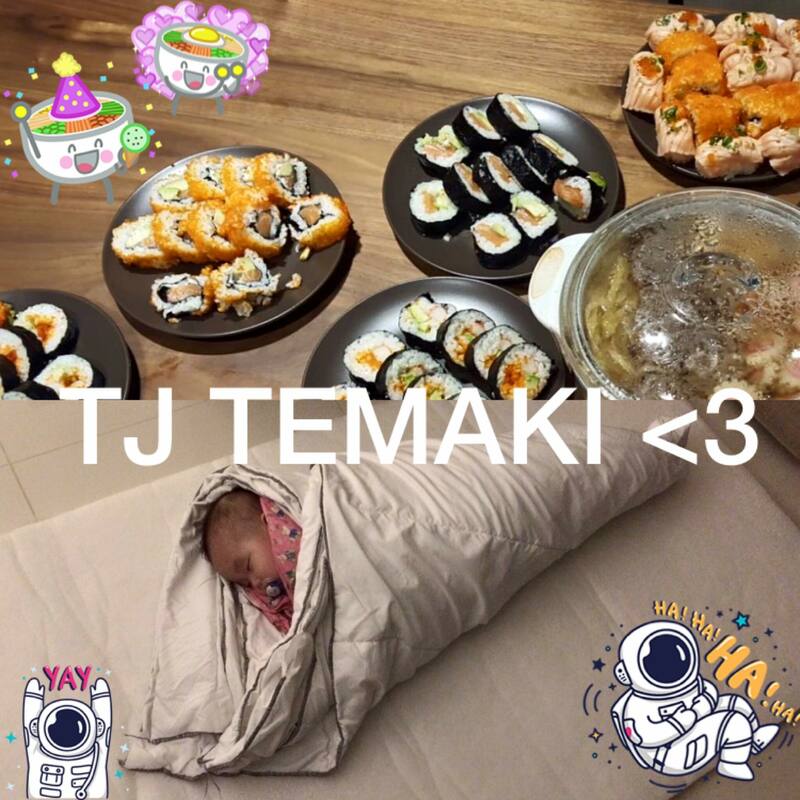 Temaki TJ and Sushi Rolls Of Love – Family Bonding! We had so much fun making sushi the other day I thought you might want to try it with your family, too! As usual, Valerie cooks without recipe but luckily, this one is easy to make up along as it is quite a mix-and-match-according-to-your-taste kind of food. I have provided the primary recipe courtesy of “Cooking With Dog” and that is… How To Cook Sushi Rice! Slightly, off the topic but since we are going to watch the video anyway, did you know that the narrator or the cooking show host, Francis, is actually The Dog? Time to assemble to the sushi. 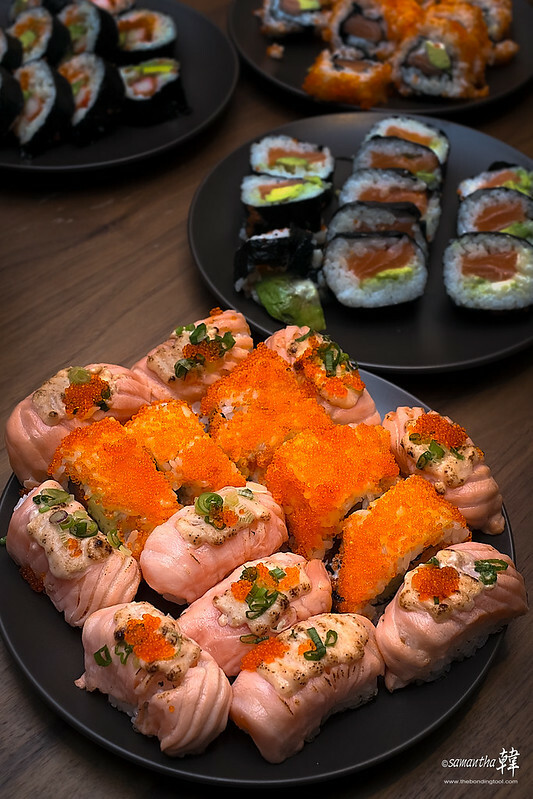 Sushi is made up of two major components: Rice and fresh Fish. 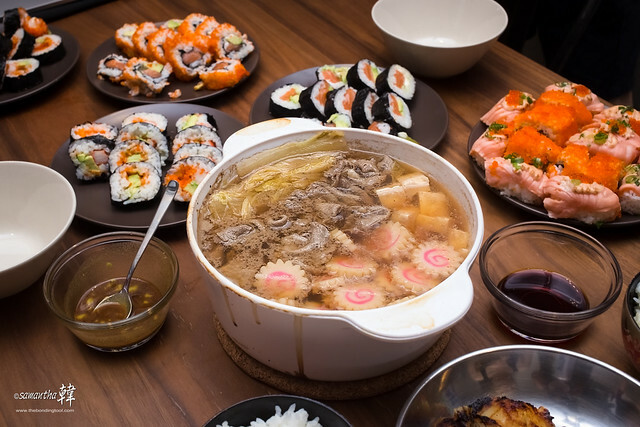 In Singapore, top grade sashimi fish is easily available so making sushi at home is not that difficult. We got our fish and condiments from a supermarket. 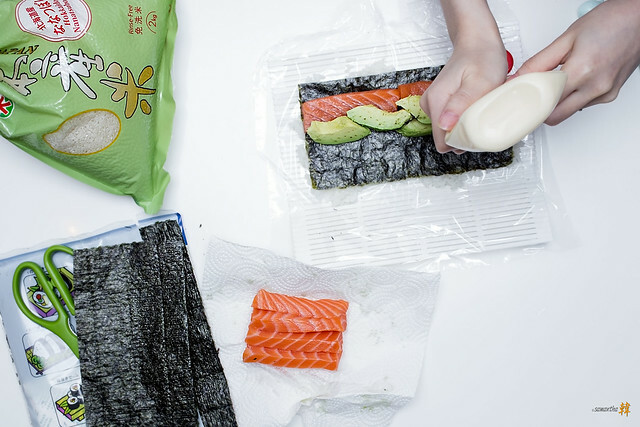 You’ll need to prepare sushi rice and practise some rolling that’s all. Perfect sushi starts with perfect rice and the best grains to cook sushi rice is called “Shari”. Hence, my emphasis in this post is not the type of sushi but how to cook the sushi rice. 300ml Sushi Rice (1.27 u.s. cup). 300ml Water (1.27 u.s. cup) – the same amount of the rice. 1 tbsp Sake (omit if you’re not comfortable with children eating sushi with sake). 5x5cm Dashi Kombu – dried kombu kelp (2×2 inch), (omit if you’re allergic to seaweed). Awasezu (Sushi Vinegar) – for seasoning rice. 50 ml Vinegar (1.76 fl. oz). Tezu (Vinegar Water) – for sterilising hands. 50ml Water (1.76 fl. oz). Wash 300ml rice until the rice is clean of starch and drain the rice in a wire sieve. Put the rice in a rice cooker, and add 300ml water, 1 tbsp sake and 5x5cm kombu kelp. Let the rice soak in the water for 30 minutes and turn on the rice cooker. Once the rice is cooked, use a wooden or plastic rice paddle to scoop out the rice. Do not use metal spoon as it will ruin the rice, and can also react with the vinegar we’ll be adding later on. Also, do not scrape the rice out from the bottom of the pot if they are charred (even slightly) as it will spoil the overall taste. Pour mixture onto the transferred rice and mix well using gentle slicing/folding motion for a couple of minutes. Let the rice cool until it reaches room temperature. You may help with the cooling process of rice by placing it in an air-conditioned room or near an electric fan (on low), but do not put the rice in the fridge to make it cool faster as that will harden the rice. 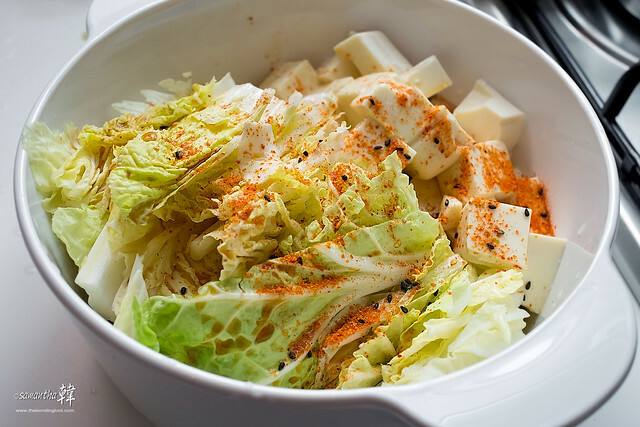 Secondary ingredients for Beef Miso Soup. 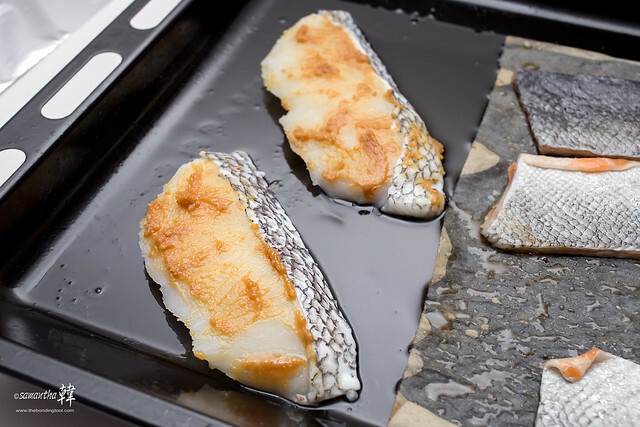 Gindara (Silver Cod) with Miso Paste. 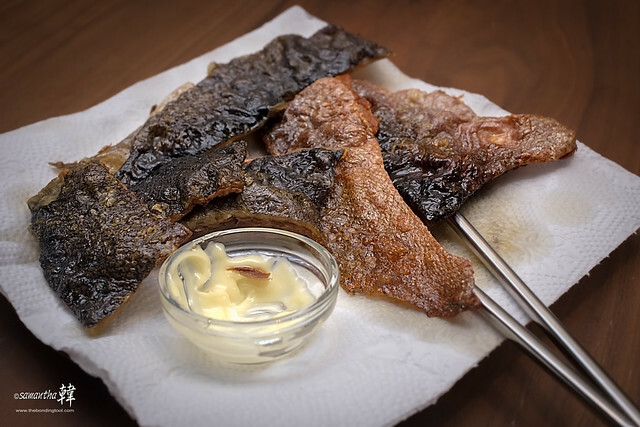 Crispy Baked Salmon Fish Skin. Sorry, couldn’t help tasting to see if the skin’s crisp up properly and they were crunchy!!! Temaki TJ and Sushi Rolls Of Love. Valerie made the sushi, Vanessa helped me take some BTS shots, Ryan cut the sushi and I rocked our little temaki, Taejin.